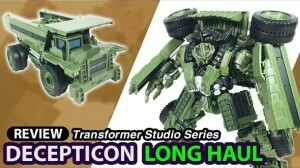 Thanks to a tip off from fellow Seibertron users, MadProject, Riley Hoffman and Bacem, we've learned that YouTuber TonTon Reviews has reviewed the next piece of Studio Series Devesator! Studio Series #42 Revenge of the Fallen Voyager Long Haul! What do you think of the review? Are you building towards your own Devesator already? Or has Long Haul convinced you that you need to start construction on a bigger display shelf? Let us know in the Energon Pub and stay tuned to Seibertron for all the latest news and reviews! bacem wrote: Found a video review on youtube, by tonton. Man this guy is quick. I know it may sound harsh, but I posted the news first on page 211, last post of the page. Also, I know it's not a race about how many news credits we get, but it would be nice to get recognized when I'm the first posting a news. MadProject wrote: I know it may sound harsh, but I posted the news first on page 211, last post of the page. Did you actually submit it to the news crew? no prob man, thank you. He did not. Posting it on the boards in no way guarantees the news crew will see it, news must be submitted. Truth be told, I am a bit worried about the ankle joints formed by Rampage and Long Haul. Are they as sturdy as CW Devastator's? JelZe GoldRabbit wrote: Truth be told, I am a bit worried about the ankle joints formed by Rampage and Long Haul. Are they as sturdy as CW Devastator's? I dont understand, US distribution is great this year, the toys are all coming out at the right time for 2 waves now. Depends on where you are in the US. The big problem is that stuff may be on the shelf at one store, but nowhere to be found at the next store. A country as big as the United States isn't always going to have every location stocking things consistently. Even in my small town, you can have completely different results depending on which store you go to. One Target on my side of town is pretty good with Voyagers and Leaders,but is awful with stocking Deluxes and smaller classes. The store on the other side of town, on the other hand, is completely hit and miss. I get that, but people were clearly talking country to country so thats what I was going with. Ah,gotcha gotcha. I see what you're saying. Yeah,the US is definitely getting the figures. There's no doubt about that. There have already been plenty of sightings that have made it to the news. Well, gonna go order voyager Prime and Bonecrusher tonight. My local walmart has completely removed the price tags for the voyager and leader SS figures, so only deluxes here for a while it looks like. Long Haul looks pretty good! I'm so stoked for all these Constructicons. D-Maximal_Primal wrote: Well, gonna go order voyager Prime and Bonecrusher tonight. I found both of them at Target tonight. You lucky duck you, I have looked for those guys for months and no luck! I go to that Target once a week, and they weren't there last time, so they must have just come in. There are still Dropkicks and Grimlocks clogging the shelves. I have still only seen 1 DoTM Megatron and 1 Jetfire, and that was almost a month ago and nearly 40 miles away. Intetesting. SS Grimlocks plural? I guess he is far less popular than Blackout in your area.